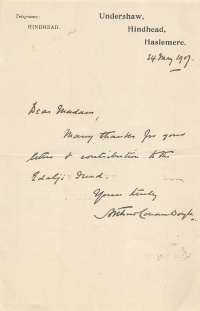 This letter dictated by Arthur Conan Doyle to his secretary Alfred H. Wood was sent on 24 may 1907 to a lady who contributed to the George Edalji Fund. Many thanks for your letter and contribution to the Edalji Fund. This page was last edited on 30 November 2017, at 15:27.